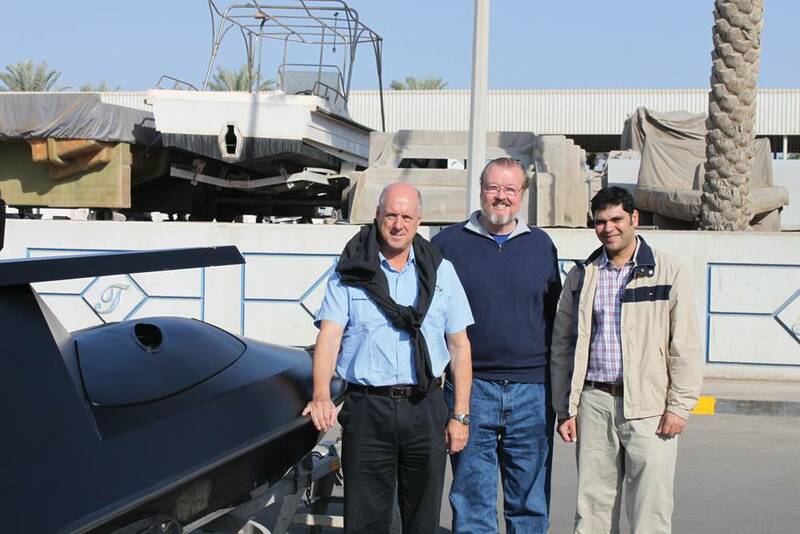 As the evolution and integration of robotics in maritime vehicles continues to reshape missions and capabilities inland, near-shore and at sea, Maritime Reporter & Engineering News last month was on hand in Abu Dhabi for the unveiling of a new Unmanned Surface Vessel family. If it delivers as designed, it will revolutionize marine robotic vehicle applications for both military and commercial purposes. 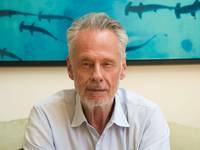 Robert J. Murphy is certainly no stranger to the world of autonomous robotic marine vehicles, having worked in the field for more than a quarter of a century, dating to the mid-1980s. But the latest turn for Murphy and his 5G International crew is perhaps the most intriguing, as he has linked up with Abu Dhabi, UAE-based Al Seer Marine to jointly develop and deliver a revolutionary family of Unmanned Surface Vessels that, if delivered as designed, will open a world of opportunities for marine robotics precisely at the time when the technology is gaining traction in military and commercial sectors. - Eclipse, the top-of-class 11-m monohull. As Murphy and his team work toward finishing its unique family of unmanned service vessels, the question begs: why here, why now? 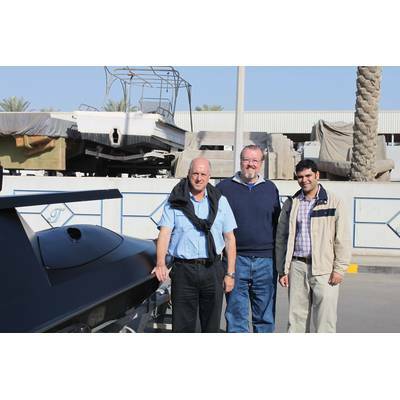 In Al Seer Marine Murphy’s 5G has a partner with broad ambitions to not simply produce a prototype for display, but with the aim to develop, design and mass produce large number of USVs to serve local military and globally security needs. Making the leap from Superyacht specialist to USV manufacturer might seem a large chasm to bridge, but not in the United Arab Emirates, where business is booming on many fronts and there is a palpable push for growth and diversity across many industries, as the government invites and inspires innovation with an eye towards the future when one day energy production is not the primary driver of the country’s economy. 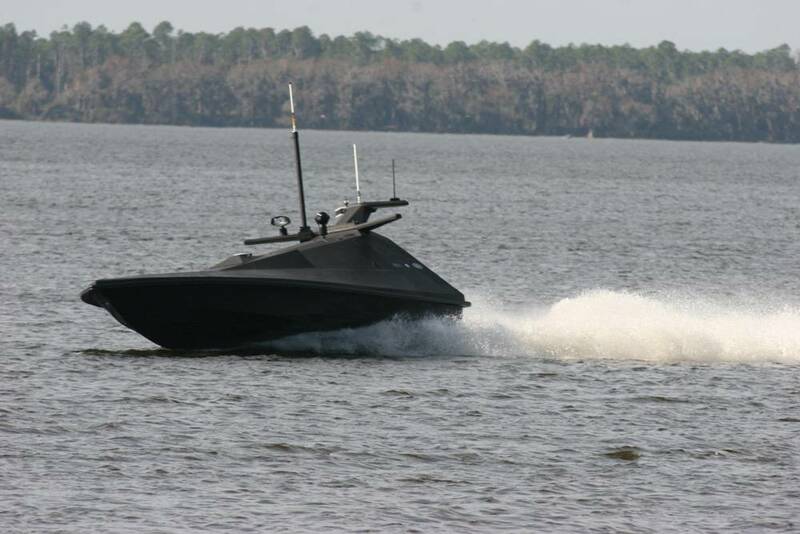 Fast forward to the Spring of 2012, when Bartlett received a call from top management to essentially ask “can we do it;” meaning could the company as currently situated design, build and deliver a USV to serve the home military market. The tight time-frame and urgency was centered solely on the upcoming IDEX military technology exhibition which is a tri-service (land, sea, air) defense exhibition, scheduled to be held February 17-21 at the Abu Dhabi National Exhibition Centre (ADNEC) is centrally located in Abu Dhabi, the capital of the United Arab Emirates. In the budding relationship between Al Seer Marine and 5G International, the initial target for the vessel was the UAE military, but as the project has evolved and markets explored, the collective believe the potential outside of military circles is much larger in potential. Focused first on the UAE military, however, has helped to create an end product that is attractive to both sectors. “First and foremost, it has to be off-the-shelf, designed and built in the UAE,” said Bartlett. In part this harkens back to the government’s desire to inspire and develop home-grown technology and industry. 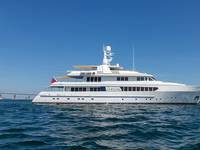 Today the fleet of USVs centers on three vessels, from the Sea Serpent, a small 3-m “jet ski” version; to the Boomeranger, the larger 11-m RIB; and the Eclipse, the top-of-class 11-m monohull. 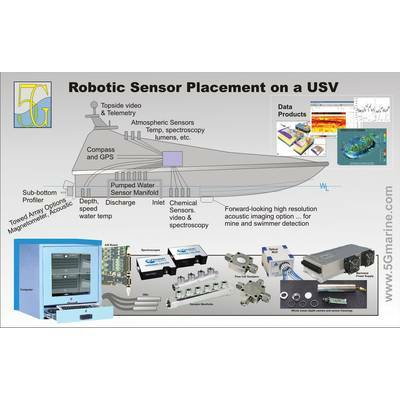 While USV technology is surely not in its infancy, in relative terms, particularly when considering dramatic strides made in aerial and ground robotics, it is still pre-puberty. To help propel its maturity, the Al Seer/5G solution takes into account not simply the vessels, but the entire package, from technical outfit to maintenance, as well as safe and efficient launch and recovery. 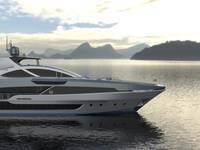 For example, an outstanding feature of the top model, the 11m Eclipse monohull, is a proprietary hybrid propulsion system. Powered by twin Fiat N67500 engines with a light commercial rating of just over 500 hp driving Rolls-Royce jets through ZF gears, the USV sports a top speed excess of 60 knots. But it is when the vessel slows down that it truly shows its value. Featuring a pair of 13kW electric motors, the proprietary hybrid propulsion system gives the USV the ability to loiter for extended lengths of time, an intelligent system that allows the user, for example, to use only one jet at a time to hold station, effectively extending battery life and subsequently loiter time by eight to 10 hours. You can’t spend more than five minutes with Robert Murphy before seeing that he is an inventor to the core. Born into an innovative family, and by his own reckoning, “raised in a factory,” Murphy’s mind seems to perpetually gravitate towards technical solutions. Hence, his work on the development of USVs doesn’t stop at the vessel, rather extends through its operational life, and he has patents on a number of ancilliary systems, from USV launch and recovery to refueling safety, efficiently at sea. 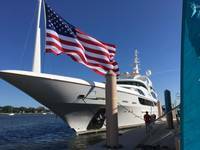 “In 2002 I was asked by two Captains of Naval Research labs in Washington to develop a handling system for unmanned vessels,” Murphy said. Launch and recovery of unmanned systems in optimal conditions can be dangerous, not to mention dealing with the pitch, roll and yaw of bigger ships, and their interaction with the smaller USV’s in rough seas. The envisioned “refueling station at sea” measures 45 ft. long, with the USVs literally docking inside and via onboard sensors delivering the appropriate quantity of fuel. The shipboard recovery system “comes down like a little gondola, it sits in the water along side the ship; the boat come in and it locks; and the device raises the boat like an elevator,” Murphy said. 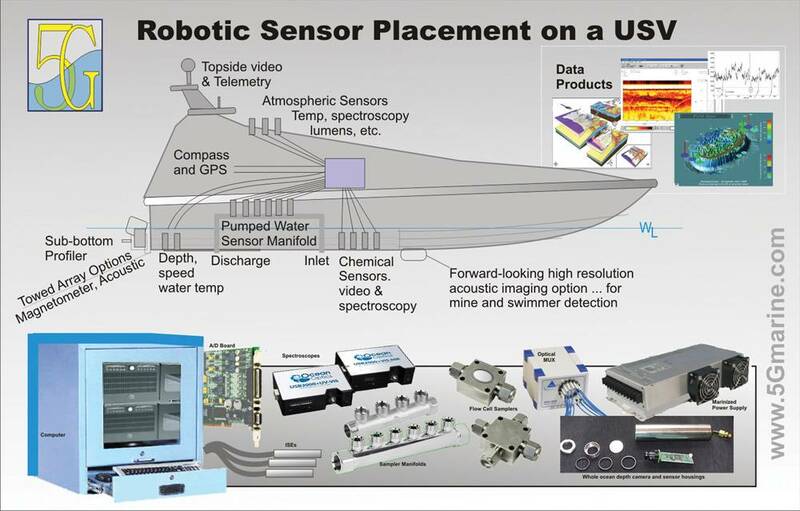 While the IDEX show this month will prove a critical litmus test for the Al Seer/5G USV collaboration, it will not fully define the collaboration, which is intent to revolutionize the business of Unmanned Surface Vessels in military and commerical markets, domestic and abroad. While having an address in the Middle East comes with a number of preconceived notions, doing business in the UAE is as close to a seamless “Western” model that you will find. The region is booming, led primarily by the continued hunt for offshore oil and gas, but diversifying to deal with a future when the resources run dry. While the UAE is pro-business, and in fact a virtual United Nations of nationalities working together throughout the country, conducting efficient business there can sometimes be trying, as the 5G found out.